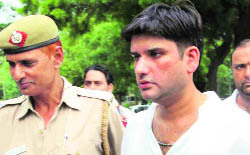 Dealing a severe blow to the image of former Uttarakhand Chief Minister ND Tiwari, the Delhi High Court today announced that DNA tests have confirmed that he is the biological father of 33-year-old Rohit Shekhar. Misusing �official powers to settle a personal score and framing a patwari in a false case� has landed six officials of the Vigilance Bureau in a soup. Chief Minister Parkash Singh Badal has ordered the registration of a criminal case against a joint director, two serving SSPs, an inspector, a former SSP and a SP after they were indicted by an inquiry. Acting Chief Justice of the Delhi High Court, Justice Arjan Kumar Sikri, is the new Chief Justice of the Punjab and Haryana High Court. Information available from Delhi suggests his name has been cleared by the Supreme Court collegium and his warrants of appointment are expected to be received by the Punjab and Haryana High Court after being signed by the President. The Congress today stepped up efforts to placate senior leader Virbhadra Singh who has offered to resign from various party committees which have been set up to prepare for the year-end Assembly elections in Himachal Pradesh. An unrepentant Briton, who called himself �Psycho� Stapleton was today sentenced to a minimum 30 years in jail for the �truly wicked� cold-blooded murder of 23-year-old Indian student Anuj Bidve that caused outrage in India and the UK. The Anna-led agitation against corruption got a shot in the arm on the third day today with Baba Ramdev�s followers swarming Jantar Mantar. The yoga guru reached the site around 3:30 pm to announce his support to the Gandhian�s cause of the Lokpal Bill.